CBRE Canada is transforming its offices across the country, so it seems only fitting the firm is moving into a new office in a Kitchener neighbourhood also undergoing a radical transformation. The firm’s Waterloo Region staff will move into an Allied Properties REIT-owned building at 72 Victoria St. S., in the heart of Kitchener’s “Innovation District,” in October. 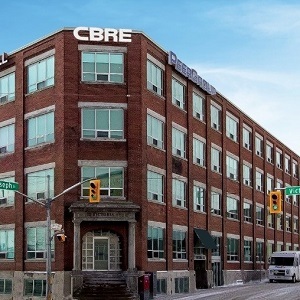 “We’re in a traditional office environment at the present time and for us to be moving into a brick-and-beam, century-old building with all the modern amenities and features that will come with it is going to be very exciting,” said Peter Whatmore, CBRE’s Waterloo Region managing director. CBRE is in a 5,000-square-foot space at the Europro Real Estate-owned The Galleria at 101 Frederick St. and will upgrade to a 7,000-square-foot location designed for 40 people in a five-storey, 89,752-square-foot, multi-tenanted building that was built almost 120 years ago at the corner of Victoria and Joseph streets. CBRE, the world’s largest commercial real estate professional services firm, employs more than 2,000 in 22 locations from coast to coast. The new Kitchener office will be the company’s ninth to be transformed in the last two years and will be the first brick-and-beam transformation within its platform. CBRE is focusing on workplace wellness and its new offices include: universal access to natural light for all employees; ergonomic sit-stand desks that reduce sedentary behaviour; noise-attenuating technology to reduce background noise; and The RISE Café, a central point to encourage socialization and collaboration among employees. “It will be an open, collaborative and innovative kind of office space,” said Whatmore. The 72 Victoria St. S. property, which also includes 228 surface parking spaces, was originally a manufacturing building that made seating for athletic facilities, including the old Montreal Forum. Allied (AP.UN-T), the largest owner of brick-and-beam office product in Canada, acquired the property in 2008. It also owns The Tannery and has a 50 per cent interest in Breithaupt Phase 1 in the same neighbourhood. CBRE will be among a growing cluster of technology companies in the Innovation District, including Google, Communitech, D2L and H2ML, that appreciate what redeveloped vintage buildings have to offer. “It’s an amazing transition of an historically old industrial area of downtown Kitchener,” said Whatmore. Kitchener-Waterloo has emerged as one of Canada’s most prominent and active startup hubs, with tech employment topping 30,000 and more than 2,000 new startups created in the last five years. Critical new infrastructure is being delivered to the region, including a transit hub that will connect Grand River Transit’s local buses, the ION light rail transit system now under construction, GO Transit services, VIA Rail, inter-city buses, taxis, car-sharing services, pedestrians and cyclists. The site is zoned for a maximum of 1.29 million square feet of density, and a request for qualifications issued by the Region of Waterloo to build a mixed-use development will close on June 30. Whatmore describes the Kitchener-Waterloo office market as “quite robust” and he said the Innovation District is a very interesting pocket where space is getting hard to find despite much recent activity. On the residential front in the neighbourhood, Momentum Developments’ One Hundred at 100 Victoria St. S. will offer 276 residential condominium suites in towers rising 15 and 19 storeys above a three-storey podium. More than 75 per cent of its units have been sold. Momentum’s 19-storey One Victoria Condominiums development at 1 Victoria St. S. is under construction and 90 per cent sold. Zehr Group has assembled a nearby six-acre site for its Sixo Midtown mixed-use condo, office and retail community at 607 King St. W. near Victoria Street.